Feel like changing the system font on your Android device? Fontster is an app for such business. It allows you to easily change (system-wide) the fonts on your Android device, all within a friendly Material UI. The trade-off is that Fonster requires a rooted device, but rooting is the gateway to customization in the first place! What makes Fontster special is that the app can replace all font styles in use by the operating system. Unlike other font installers that only replace a few of the font styles, this one changes all styles to result in a consistent look across all text. This means that practically all of the typed elements throughout your devices' UI will be changed to your desired font. This includes items such as the keyboard, digital clock widget, and web pages. Unsure about which fonts to choose? Fontster lets you access about 150 full font families (with more being added constantly). There's also font previewing, so you don't have to commit while auditioning fonts. The app also lets users backup and restore fonts, test fonts prior to installing, and view the currently installed font. Fontster works best with devices running Android builds close to stock (AOSP). Nexus devices, for example, tend to work great with this app. Although the app has been tested and confirmed to be working on non-AOSP devices (based on, say, Samsung's Touchwiz), caution is recommended, so make backups before messing around with it! 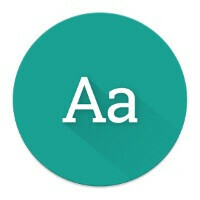 Fontster is free and can be downloaded from Google Play.